An image depicting C-reactive protein can be seen below. CRP may be ordered, for example, when a newborn shows signs of infection or when an individual has symptoms of sepsis, such as fever, chills, and rapid breathing and heart rate. CRP may also be ordered to monitor conditions such as rheumatoid arthritis and lupus and is often repeated at intervals to determine effectiveness of treatment. hs-CRP can be ordered for patients with some established risk factors of coronary heart disease to determine strategy for prevention of cardiovascular events and for follow-up of patients with acute coronary syndromes. CRP, being a marker of acute inflammation, is elevated 100-1000 fold after infection or trauma and, thus, for its utility as a cardiovascular risk marker, it needs to be measured 2 times at least 2 weeks apart, in a metabolically stable state, post-infection or illness, since its half-life is 19 days. Universal hs-CRP screening is currently not warranted except in patients with an intermediate-high Framingham risk score. Burris CA, Ash wood ER, Burns DE. Tietz Textbook of Clinical Chemistry and Molecular Diagnostics. 4th ed. St. Louis: Elsevier Saunders; 2006. 1633: 962-967. McPherson RA, Matthew R. Pincus MR. Henry's Clinical Diagnosis and Management by Laboratory Methods. 22nd ed. Elsevier Saunders: Philadelphia; 2011. 254-5. Casas JP, Shah T, Hingorani AD, Danesh J, Pepys MB. C-reactive protein and coronary heart disease: a critical review. J Intern Med. 2008 Oct. 264(4):295-314. [Medline]. Devaraj S, Singh U, Jialal I. Human C-reactive protein and the metabolic syndrome. Curr Opin Lipidol. 2009 Jun. 20(3):182-9. [Medline]. [Full Text]. Williamson MA, Snyder LM, Wallach JB. Wallach's interpretation of diagnostic tests. 9th ed. Philadelphia: Wolters Kluwer/Lippincott Williams & Wilkins Health; 2011. Barr WG RJ. Rheumatology in the ICU. Hall JB SG, Wood LD, editor. Principles of Critical Care. 3rd ed. New York McGraw-Hill: 2005. Pepys MB, Hirschfield GM. C-reactive protein: a critical update. J Clin Invest. 2003 Jun. 111(12):1805-12. [Medline]. McPherson RA, Pincus MR, Henry JB. Henry's clinical diagnosis and management by laboratory methods. 21st ed. Philadelphia: Saunders Elsevier; 2007. Tillett WS, Francis T. Serological reactions in pneumonia with a non-protein somatic fraction of pneumococcus. J Exp Med. 1930 Sep 30. 52(4):561-71. [Medline]. CAA39671.1 G. C- reactive Protein ( Homo Sapiens). [September 2, 2012]; Available from: http://www.ncbi.nlm.nih.gov/protein/30224. Shine B, de Beer FC, Pepys MB. Solid phase radioimmunoassays for human C-reactive protein. Clin Chim Acta. 1981 Nov 25. 117(1):13-23. [Medline]. JB I. Laboratory Diagnosis. Imboden JB HD, Stone, editor. CURRENT Rheumatology Diagnosis & Treatment. 2nd ed. New York: McGraw-Hill; 2007. Abou-Raya A, Abou-Raya S. Inflammation: a pivotal link between autoimmune diseases and atherosclerosis. Autoimmun Rev. 2006 May. 5(5):331-7. [Medline]. Pearson TA, Mensah GA, Alexander RW, Anderson JL, Cannon RO 3rd, Criqui M. Markers of inflammation and cardiovascular disease: application to clinical and public health practice: A statement for healthcare professionals from the Centers for Disease Control and Prevention and the American Heart Association. Circulation. 2003 Jan 28. 107(3):499-511. [Medline]. Peripheral Blood Neurofilament Light Chain Levels: The Neurologist's C-reactive Protein? 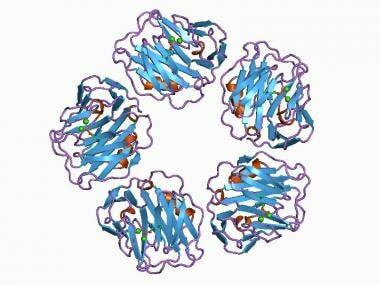 News C-Reactive Protein: A Prognostic Biomarker for ALS? Journal Article Peripheral Blood Neurofilament Light Chain Levels: The Neurologist's C-reactive Protein?